As a nationwide frequency coordinator of microwave backhaul, Wireless Applications, Corp. is required by the FCC to keep wireless providers in compliance when deploying their networks. As the number of microwave providers increases, the ability to recommend ideal frequencies has become more complex. When performing the analysis, we account industry guidelines, antenna/radio specifications, terrain loss, and identify the channels/frequencies that will best address your design requirements. With the power of SiteSync Pro, users can scope and research the competitive landscape of microwave backhaul in proximity of their proposed network geography as the first step of understanding what challenges they may face. By searching licensed microwave records through the FCC data within SiteSync Pro, users can instantly understand the length of paths being engineered, the frequencies and channels that are presently being utilized, as well as the specific antenna and radio specifications being utilized. 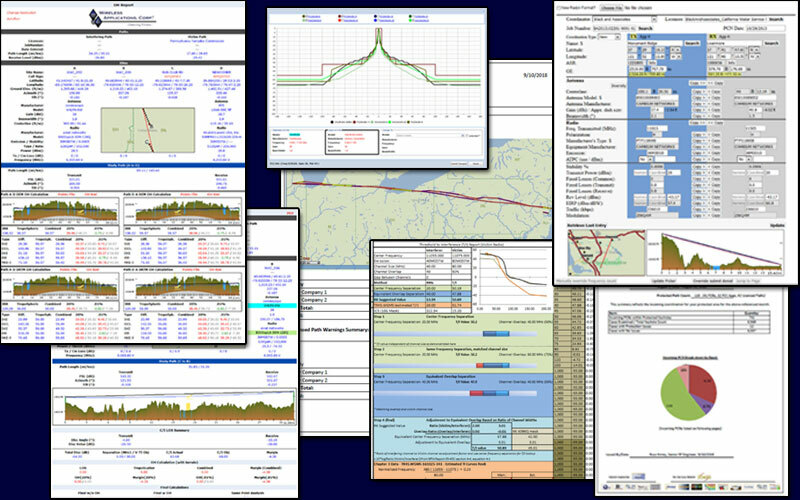 By using predictive tools like the WAC eTool and the eReach tool, users can use these two resources to build out some of the most resilient network designs even before they being the Prior Coordination Notice (PCN) process. As a nationwide coordinator, Wireless Applications, Corp. is required to provide all the appropriate documentation and analysis for microwave users that is in compliance with the FCC rules and regulations. As a common-carrier frequency coordinator we are required and governed to adhere to the coordination process within the Part 101 filing protocol. With nearly 20 years of experience in frequency analysis and coordination, Wireless Applications, Corp. is proud to offer our clients an "all options considered" approach to finding feasibility and have the expertise to find feasible links that many others are not able to find. We offer these services across all verticals and industries that all design, engineering, and maintain communication network infrastructures nationwide.